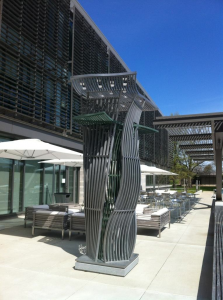 Sculptor Don Gummer created “Basic Action,” the stainless steel and bronze work recently installed on the patio of the Cyberinfrastructure Building on the far east side of the Bloomington campus. “Basic Action,” by Don Gummer was recently installed on the patio at the Cyberinfrastructure Building. Fittingly, the 12-foot sculpture was unveiled during today’s dedication of Big Red II, the fastest university-owned supercomputer in the nation. Brand’s wife, Peg, visited the Bloomington campus to see the sculpture and attend a private lunch with McRobbie, his wife Laurie Burns McRobbie, Gummer and other special guests. Gummer said he discussed Brand’s vision with others and read several of his books before beginning work on the piece. “The central concern for me was to visually come as close to the public spirit and philosophy of Myles Brand,” Gummer said at the dedication ceremony, saying the sculpture is intended to convey a sense of irrepressibly moving upward, with one thing leading to another in a quest for order and reason. Gummer grew up in Indiana and studied at IUPUI’s Herron School of Art and Design from 1964 to 1966. He later earned bachelor’s and master’s degrees in fine arts from Yale University School of Art. In 2009, Indiana University awarded him an honorary Doctor of Humane Letters. Although recognized internationally for his artwork, others might recognize Gummer through his wife, the actress Meryl Streep, who attended today’s event. His work isn’t new to Indiana University. Gummer has two pieces installed on the IUPUI campus — “The South Tower,” a tribute to the World Trade Center buildings destroyed in the September 11th attacks, and “Open Eyes,” a stainless steel and colored glass sculpture.